Today I want to highlight two very different automatic features of WorldClient, autoresponders and autocomplete. Totally unrelated but both useful features that help Outlook users feel at home. 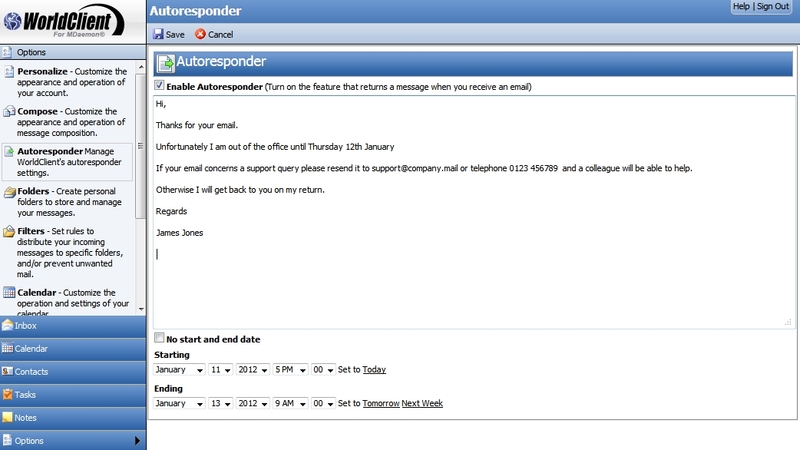 WorldClient makes it very easy to setup and schedule an ‘Out of office’ Autoresponder, often used over holiday periods but also useful when you know you’re going to be out of the office. When composing a message as you type the to address, WorldClient will look-up against your personal contacts for a match and allows you to quickly select recipients from the pull-down list.